Current feature: Remembering the Rat Patrol set and series, then 1967, and now 2007! The Rat Patrol was an American TV program that aired on ABC during the 1966-1968 seasons. The show followed the exploits of four (three American and one British) Allied soldiers who were part of a long range desert patrol group in the North African campaign during World War II. 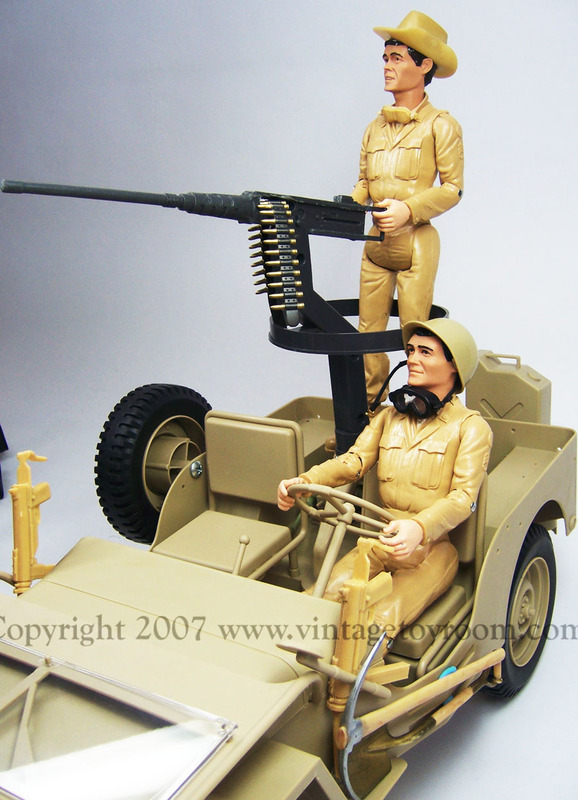 Their mission: "to attack, harass and wreak havoc on Field Marshal Rommel's vaunted Afrika Korps". ! Enter stage right, Marx Toys. Back in the 1950's and 1960's, Marx® Toys (founded by Louis Marx & Co.) was notorious for toys that tied in with television. 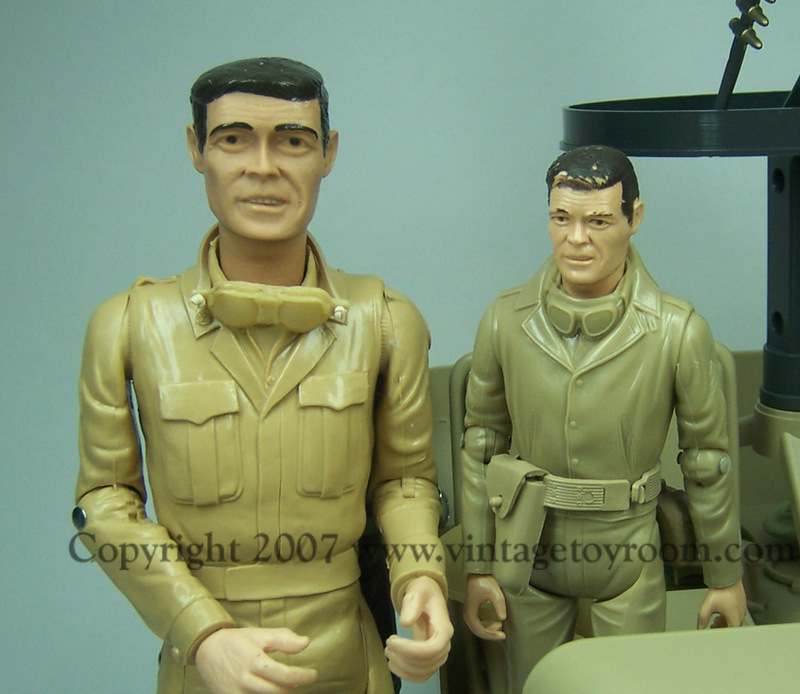 One of such examples is the Rat Patrol set produced in 1967. 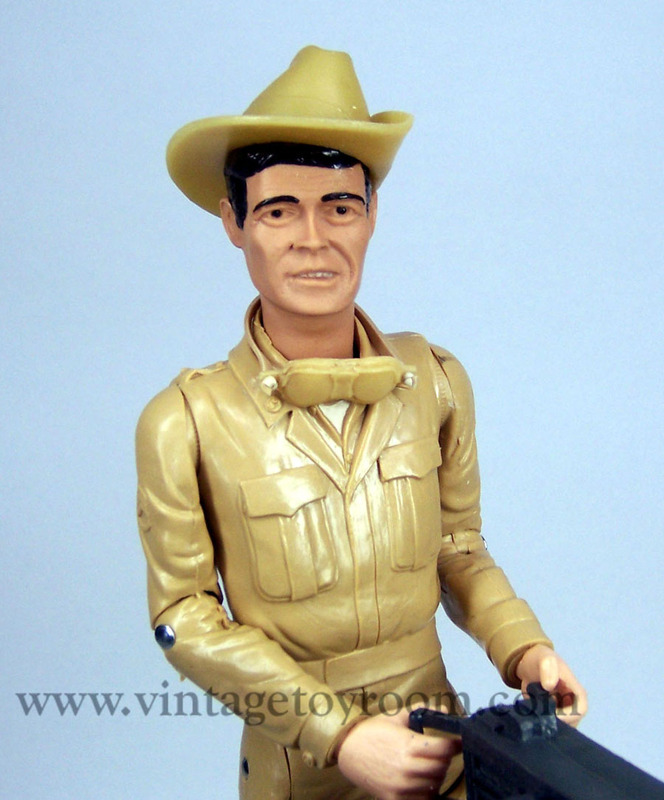 From 1966-1968, the Rat Patrol series was in full motion bringing out more W.W.II adventure. 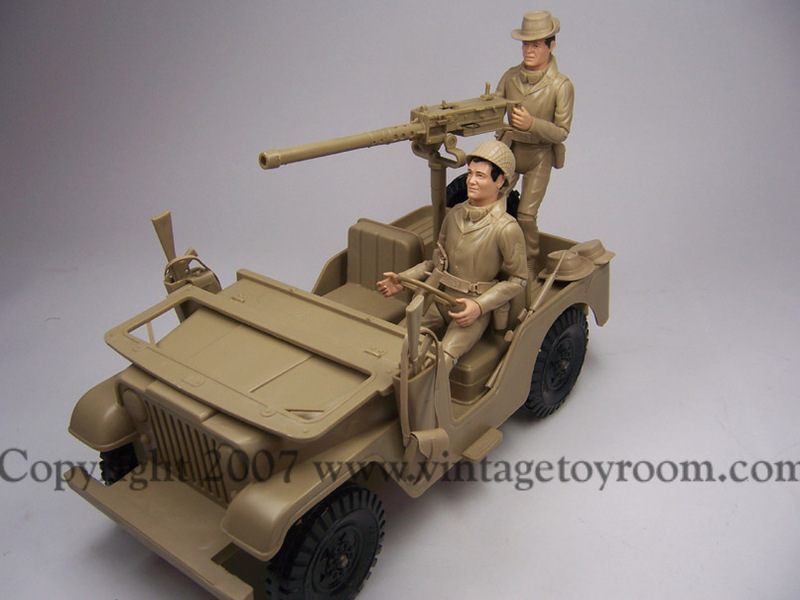 There were roughly 58 episodes produced in the two-season span showing plenty of desert patrol action. 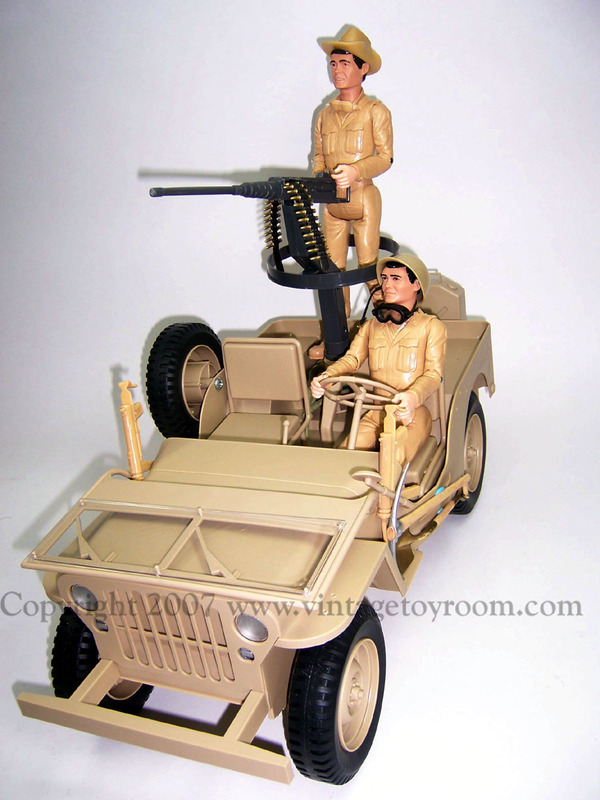 The premise of the show was an elite team of allies, driving two heavily armed jeeps, takes on the German army in North African territories in W.W.II. These teams consisted of two jeeps, with the first headed by an U.S. Sgt. 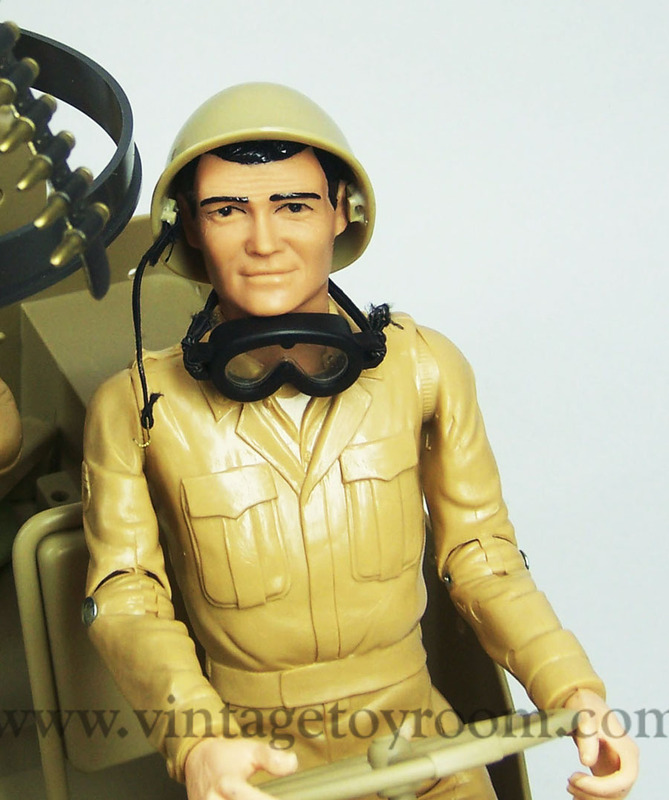 Sam Troy played by actor Christopher George and Pvt. Mark Hitchcock (Hitch) played by actor Larry Casey. British Sgt. Jack Moffitt, played by actor Gary Raymond and Pvt. Tully Pettigrew played by actor Justin Tarr headed the second jeep. Throughout the series we followed the path of these soldiers up against various “raids” in each episode. The Rat Patrol team always kept one step ahead of German trouble. The main thorn in their sides was Hauptmann (Captain) Hans Dietrich, played by actor Hans Gudegast (a.k.a. Eric Braeden). The German Captain was always trying to defeat the Rat Patrol, but lost at the end of every attempt. The members of the Rat Patrol team kept total control until they were terminated in 1968. Not by Dietrich of course, but by the network cancellation of the television show. The Marx Set- Louis Marx & Company produced the set to capitalize on the Television theme. Like the well-known Johnny West action figures, the Rat patrol figures were molded out of poly-plastic and completely movable. One major difference of course was the size. 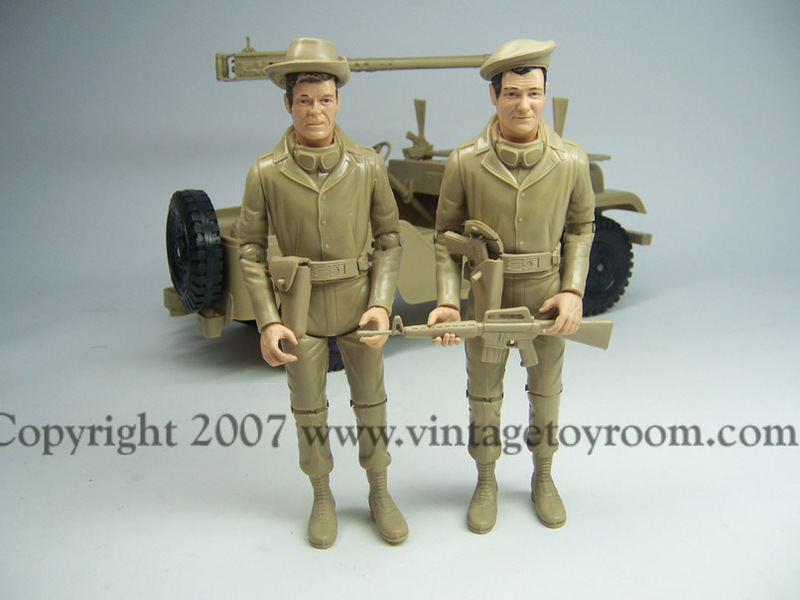 The Rat Patrol figures were roughly 7.5 “ tall and molded in desert tan. The figures can also be identified by the molded on goggles around their necks. 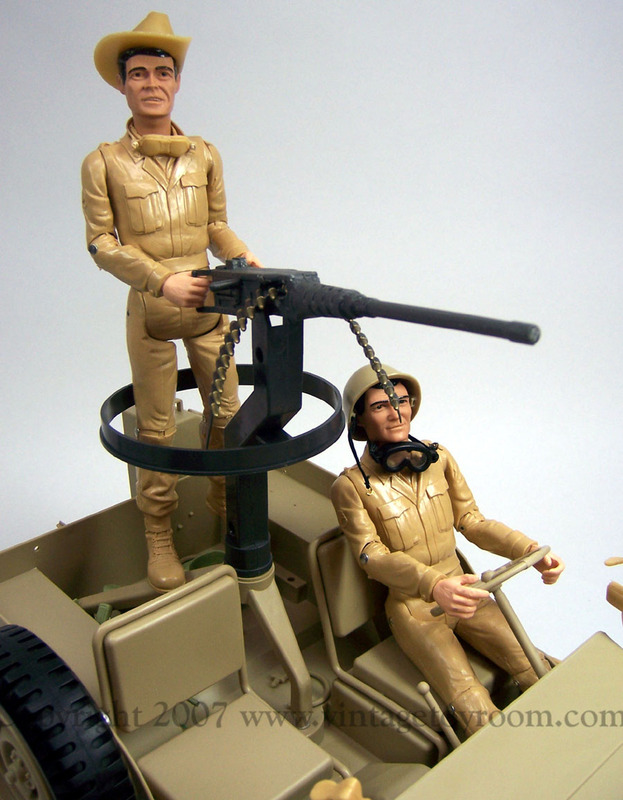 The two figures produced were Sgt. Sam Troy and Sgt. Jack Moffitt. The head sculpt resemblance to the actors is astounding. Why the two Sgt.s were grouped as a pair seems unclear to me? I guess rank prevailed during the decision on what characters were to be developed and manufactured. The figures were each given 10 vinyl accessories such as (4) hats, holster, canteen, walkie-talkie, shoulder bag, M-16, and Pistol. Also included in the set was a hard plastic (polystyrene) jeep. The jeep came with a mounted spare, movable windshield, (2) M-16 rifles, (2) M-16 holders, and a shell firing jeep mounted machine gun. 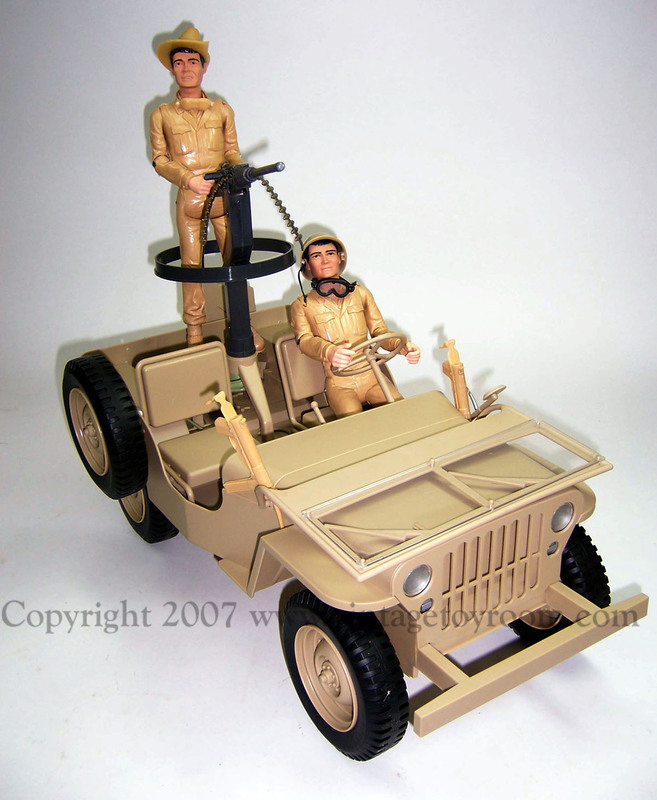 All jeep accessories were molded in hard plastic like the jeep itself. What are the problems with the Rat Patrol set today? How did they hold up after 30 years of storage? If the vinyl accessories were stored touching the hard plastic pieces, chemical melts occurred, resulting in damage. In most cases the shells are missing in action, go figure, as they are about the size of a grain of rice. I bet Mom's vacuum played a role in this one. Lastly the Box is thin cardboard and is rarely seen today in mint shape. The flaps and corners are typically torn or ripped. In most cases Rat sets are found loose with no packaging. The figures themselves are typically found with hair wear (watch for hair painters), and many times have typical elbow stress cracks. About 80% of the figures I find have stress cracks. Prices-? Prices I have seen today vary. Market conditions or demand dictates price. I have seen a MIB one recently at a show for $800 in the late 1990's. I have seen the same in toy magazines for prices but broader ranged going down to about $475. Loose sets tend to run much less. Loose sets run about $200 in 2007, and boxed still should bring $500. Market demands can be unstable as in any vintage collectible. Figures alone range from $35-$130 based on conditions and accessories. 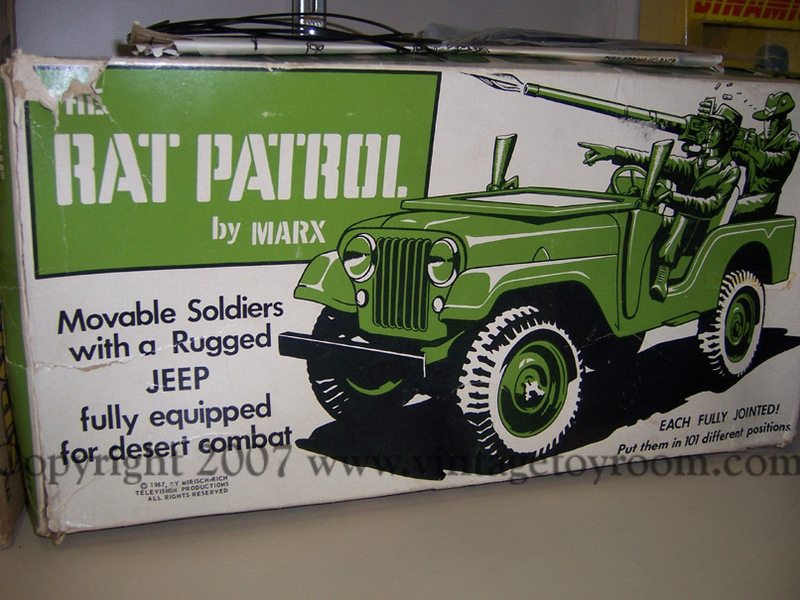 If you like vintage Marx figures from the 60's and 70's or The Rat Patrol series itself, this set might be for you. Its small enough for displaying (doesn't take up a room like some collectibles...), and has amazing detailing. 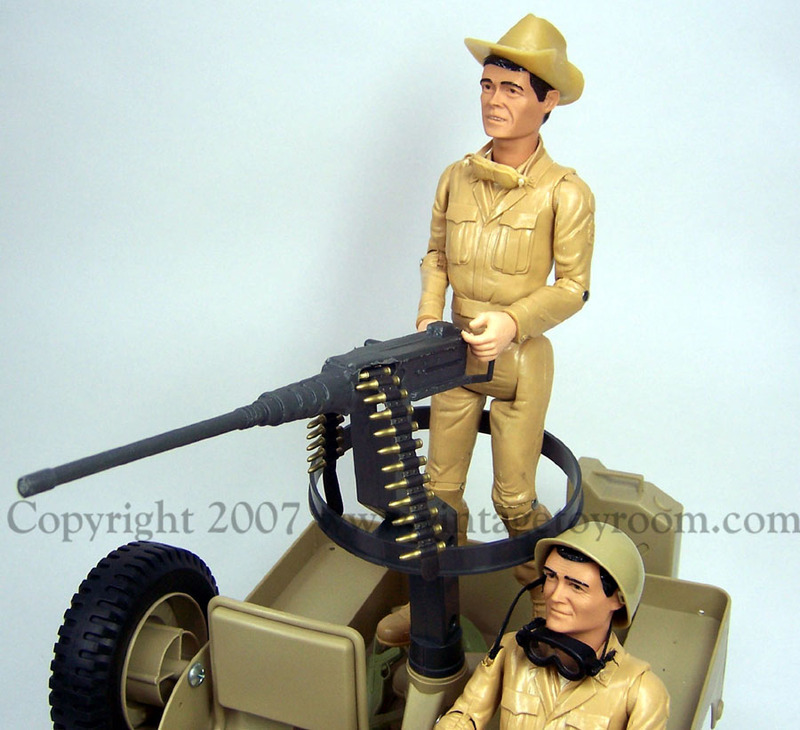 If you can live without the firing shells and box, you will save $$ and most likely find the set in decent shape. More information on this set is of course highly detailed in our encyclopedia. 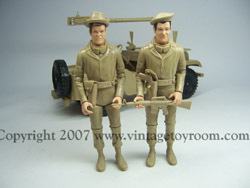 Enter stage left, 2007 12" Rat Patrol figures. As many of you know, Marx produced Stony Smith also in the 1960's. 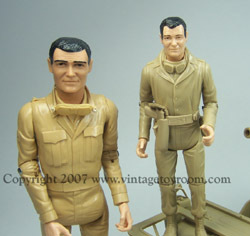 The figures were 1/6 scale, molded in OD, green. 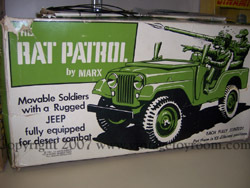 Rumors spattered in the 1990's that Marx did a 12" Rat Patrol figure, however no proof ever surfaced they were such a thing. Flash ahead to 2007, CXR AKA The Circle X Ranch, Toy Trakerz, Noah Coop, has done them. They are being made on a limited bases, however they are here. I have had the chance to aquire a set, and wanted to share what they are like. The face sculpts look very good. They certainly replicate the 7.5" figs well. The bodies are Reissue Marx, produced in Mexico in the past decade. See pictures I have done with these awsome figures. 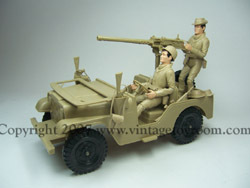 I used a Jeep crafted in the GI Joe world by Disimone for desert patrol Joes. As you can see, it makes one sweet set. Is the set for sale? I suppose if the right offer came through it is, but it will not come easy. If you are interested in the figures, drop me an email and I will see what I can do. Enjoy the pictures, and remember to click them for the enlarged versions. Jack Moffitt (Actor Gary Raymond) and Sam Troy (Actor Christopher George), are shown for comparisons. The likeness as you can see was well done. Enjoy the pictures, let us know how you like the way we put the set together. Thanks to GI Joe collectors, we have an excellent jeep for these guys!